LOOKING FOR A DEAL? CHECK OUT OUR CABINET MAKERS SPECIALS! ORDERS TAKEN BY FRIDAY TYPICALLY SHIP THE FOLLOWING FRIDAY. Perfect Plank Co. has been manufacturing kitchen counter tops, islands, table tops, sign blanks and other butcher block products for more than 50 years. We offer a full range of sizes in Alder, Maple, Mahogany, Walnut, Sugar Pine, Jelutong, Redwood and Western Red Cedar. Our products are suitable for all domestic and commercial uses. We can manufacture a single maple butcher block counter top or island for your kitchen, or we can produce 100 maple or mahogany table tops for your rustic Italian restaurant. We specialize in rapid delivery: Orders received on Friday can ship as quickly as the Friday of the following week**. If there is anybody in the industry with lower prices or quicker delivery, we haven't found them. Most Perfect Plank is manufactured in the standard butcher block format with narrow laminations (0.75" to 2")***. This includes counter tops, table tops, islands and sign blanks. We also offer Knotty Pine table tops and counter tops with wider laminations (3" to 5"). (These are made from full-length strips; that is, NO finger-joints). In addition to the standard butcher block counter tops and table tops, Perfect Plank can also be used for paneling, cabinet parts, stair treads, and flooring. Within certain limits we try to promise: ANY THICKNESS (up to 3 1/2"), ANY WIDTH (up to 54"), and ANY LENGTH (up to 16 feet). PLEASE READ CAREFULLY IF YOU ARE A RESIDENTIAL CUSTOMER. ** We batch our orders, so an order placed on a Monday (after our Friday deadline) would ship the Friday of the following week. For more information, call or e-mail our main office. *** Please be aware: We CANNOT GUARANTEE a requested lamination width for your tops. If ordering multiple combinations of lengths, expect there to be differences in lamination widths between each top, as this is sometimes out of our control. Designing an order to come out of a single length can help avoid multiple lamination widths between boards. For further explanation, please talk to someone at our ordering desk. Yes! Our own sign is made from sand-blasted Western Red Cedar! BLACK WALNUT-- Standard Walnut Butcher Block with 3/4" to 2" laminations and finger- joints. Made from 8" to 24" pieces of Eastern Black Walnut, finger-jointed end-to-end to make strips of desired length. Available in thickness of 1 3/8" and 1 3/4". Widths to 60". Lengths to 12 ft. Appropriate for counter tops, table tops, restaurant tables, islands and bars. BLACK WALNUT WILDWOOD-- MORE PICTURES COMING SOON. Customers hoping to obtain a distinct look for their restaurant or home often choose Walnut Wildwood, in which we intentionally mix the darker heartwood with pieces of lighter sapwood. The plank also contain a greater variety of textures and grain patterns than in our conventional Black Walnut plank. Standard Walnut Butcher Block with 3/4" to 2" laminations and finger-joints. Made from 8" to 24" pieces of Eastern Black Walnut, finger-jointed end-to-end to make strips of desired length. Available in thickness of 1 3/8" and 1 3/4". Widths to 60". Lengths to 12 ft. Appropriate for counter tops, table tops, restaurant tables, islands and bars. MAPLE--Standard Butcher Block withlaminationsranging anywhere from 3/4" to 2" . Made from 10" to 24" pieces of Pacific Coast Maple, finger-jointed end-to-end to make strips of desired length. Avilable in any thickness from 3/4" to 1 7/8". Widths to 72". Lengths to 16 ft. Appropriate for counter tops, table tops, restaurant tables, islands and bars. MAPLE SELECT-- (No Finger-joints).--Standard Butcher Block with 3/4" to 2" laminations. Made from clear strips of Pacific Coast Maple Avilable in both 1 3/8" and 1 7/8" thicknesses. Widths to 60". Lengths to 96". (8ft availability limited) Also appropriate for counter tops, table tops, restaurant tables, islands and bars. MAPLE WILDWOOD--*Temporarily limited in supply-- Plank purposefully made to include a wide range of colorations, textures and grain patterns. Available in thicknesses 1 3/8" and 1 7/8". Lengths up to 12 feet in some thicknesses. Designed primarily for restaurant table tops and other applications in which a rustic appearance is desired. Because of its lower price it is also widely used for work bench tops, shelving, room dividers, stair treads and garage components. *Maple Wildwood is a Bi-product of the Standard Maple Perfect Plank and availability can be unpredictable. Please call our office to check availability. Alder Wildwood also available in limited supply. ALDER-- Alder is a favorite of furniture makers and other woodworkers because of its ability to accept stains in a variety of colors and shades. It is slightly less dense than maple, but more machineable. Standard butcher block format with 3/4" to 2" laminations. Available in thicknesses of 1 3/8" and 1 3/4". Lengths to 12 feet. Appropriate for counter tops, table tops, restaurant tables, islands and bars. MAHOGANY-- As environmental concerns about South American forests have increased, plantation-grown mahogany has emerged as a popular (and less expensive) alternative. These trees were planted at various locations in the South Pacific after World War II and are being harvested on a sustained yield basis. Plantation mahogany has more color variance and slightly different grain patterns than the South American-grown material. Finger-jointed in thicknesses of 1 3/8" and 1 3/4". KNOTTY-PINE TABLE TOPS-- Manufactured from Sugar Pine native to Oregon and Northern California. Laminations are 3.5" to 6" wide. Available in a thickness of 1 3/8" and 1 3/4". Full- length strips (No finger-joints). Lengths to 12 feet. Appropriate for table tops and restaurant tables. Also used for paneling and ceilings. NOTE: Knotty pine orders often take three to four weeks to produce. 1 ¾” currently in very low supply. Call for availablility. 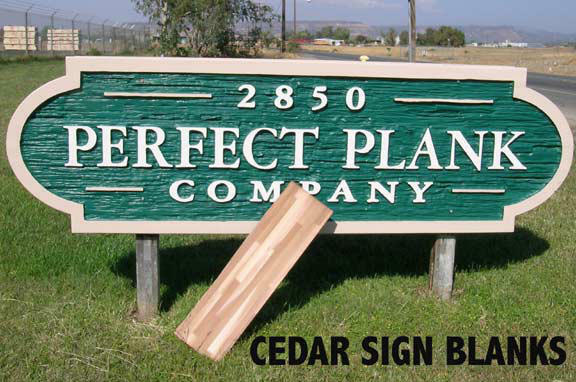 WESTERN RED CEDAR SIGN BLANKS-- Standard butcher block format with 1.4" wide laminations. Full length strips--no finger joints! Available in following thicknesses: 1 1/2", 1 3/4", and 3". Widths to 72". Lengths to 143". Appropriate for sand-blasted signs, wood-carved signs, and routered signs. Also used for paneling and table tops on occasion. MIRVANA (Discontinued)-- Mirvana is lighter and less dense than Mahogany but has similar appearance. Of the remaining pieces we have left in stock we have both Mirvana (Finger- jointed) and Mirvana Select with no finger joints. Used for restaurant tables, coffee tables, and other interior applications. Limited availability in both 1 ⅜” & 1 ⅞" thickness (1 ⅞” ONLY for Select Grade).